Objectives To describe short-term (up to 12 months) and long-term (up to 7 years) damage in patients with newly diagnosed antineutrophil-cytoplasm antibody-associated vasculitis (AAV). Methods Data were combined from six European Vasculitis Study group trials (n=735). Long-term follow-up (LTFU) data available for patients from four trials (n=535). Damage accrued was quantified by the Vasculitis Damage Index (VDI). Sixteen damage items were defined a priori as being potentially treatment-related. Results VDI data were available for 629 of 735 patients (85.6%) at baseline, at which time 217/629 (34.5%) had ≥1 item of damage and 32 (5.1%) ≥5 items, reflecting disease manifestations prior to diagnosis and trial enrolment. LTFU data were available for 467/535 (87.3%) at a mean of 7.3 years postdiagnosis. 302/535 patients (56.4%) had VDI data at LTFU, with 104/302 (34.4%) having ≥5 items and only 24 (7.9%) no items of damage. At 6 months and LTFU, the most frequent items were proteinuria, impaired glomerular filtration rate, hypertension, nasal crusting, hearing loss and peripheral neuropathy. The frequency of damage, including potentially treatment-related damage, rose over time (p<0.01). At LTFU, the most commonly reported items of treatment-related damage were hypertension (41.5%; 95% CI 35.6 to 47.4%), osteoporosis (14.1%; 9.9 to 18.2%), malignancy (12.6%; 8.6 to 16.6%), and diabetes (10.4%; 6.7 to 14.0%). Conclusions In AAV, renal, otolaryngological and treatment-related (cardiovascular, disease, diabetes, osteoporosis and malignancy) damage increases over time, with around one-third of patients having ≥5 items of damage at a mean of 7 years postdiagnosis. The concept of damage infers irreversible aspects of disease which will not respond to escalation of immunosuppressive treatment,8 in contrast with potentially reversible disease activity. The Vasculitis Damage Index (VDI)9 is a validated checklist of 64 items, recording all damage from the onset of vasculitis, irrespective of whether it is caused by disease or treatment. The VDI is easy to use, with good test-retest repeatability and content validity,8 ,9 and is predictive of future mortality.10–12 Patients with systemic vasculitis, who have ≥5 recorded items of damage, have a 6.4-fold increase in mortality risk (95% CI 2.1 to 19).10 The number of relapses is associated with an increase in VDI score13 ,14 and early disease activity scores correlate moderately well with later VDI scores.14 ,15 The VDI has been approved by the Outcome Measures in Rheumatology (OMERACT)8 group and the European League Against Rheumatism (EULAR),16 as the key outcome measure to record damage in AAV clinical trials. The European Vasculitis Study Group (EUVAS) oversees multicentre randomised controlled trials (RCTs) in patients with GPA and MPA. Each complies with the European Community Study Group on Clinical Trials in Systemic Vasculitis (ECSYSVASTRIAL) guidelines, produced to standardise data collection tools, disease scoring and treatment regimens.17 The VDI is scored at regular time points throughout each trial, providing prospectively recorded damage information.17 A long-term follow-up (LTFU) questionnaire to collect patient outcomes has subsequently been completed by clinicians in four of these trials approximately 5 years after study completion. Previous smaller studies including the Wegener's Granulomatosis Etanercept Trial (WGET)18; a UK series of systemic vasculitis patients10; and a Norwegian study of patients13 have described cumulative damage, focusing on patients with GPA. The objective of this longitudinal observational study is to describe the type and extent of damage accrued by patients with GPA and MPA, and different ANCA subtypes, during the course of the EUVAS trials and over LTFU. A total of 735 patients with newly diagnosed GPA and MPA were recruited between 1995 and 2009 into six EUVAS RCTs19–24 (table 1). Patients enrolled in CYCAZAREM, MEPEX, CYCLOPS, IMPROVE and RITUXVAS had moderate to severe renal involvement; those in NORAM none to mild. The trials were performed in accordance with the 1964 Declaration of Helsinki and subsequent amendments; ethical approval was obtained by national and local ethics committees in accordance with national legislation. All patients had a diagnosis of GPA or MPA on adapted 1994 Chapel Hill disease definitions,25 clinical presentation, positive ANCA serology and/or histology.17 Patients with life-threatening pulmonary haemorrhage, coexistent autoimmune condition, malignancy, infection, pregnancy or aged <18 or >80 years were excluded. The LTFU questionnaire was performed in accordance with the 1964 Declaration of Helsinki and subsequent amendments; ethical approval was obtained by national and local ethics committees as required. Details of 535 patients recruited to four trials (NORAM, CYCAZAREM, MEPEX, and CYCLOPS) were collected between September 2004 and January 2007, approximately 5 years after trial completion. Data collected included mortality, the VDI and glucocorticoid use. Baseline data recorded for each patient included age, gender, and laboratory measures. The ANCA type was recorded as myeloperoxidase ANCA (MPO-ANCA) when positive by MPO-ANCA ELISA or a perinuclear ANCA (pANCA) pattern on immunofluorescence microscopy; as proteinase 3 ANCA (PR3-ANCA) when positive by PR3-ANCA ELISA or a cytoplasmic ANCA (cANCA) pattern by indirect immunofluorescence microscopy. The BVAS V.2 is a checklist of 66 items used to score vasculitis disease activity.26 Total scores are calculated from the sum of all positive individual items. Data were collected prospectively within the trials at 0, 3, 6, and 12 months. The VDI is a validated checklist of 64 items divided into 11 categories,9 10 relating to specific organ systems and an ‘other’ category relating to potential treatment side effects.11 An item of damage is only recorded if it occurred after the onset of vasculitis and is considered permanent, defined as present for more than 3 months. In the case of patients with established comorbidity, prior to vasculitis, this is only recorded if it has deteriorated significantly for at least 3 months since disease onset. There is no attribution to cause, so the VDI can capture the effects of disease or therapy. There is no weighting of items or reversibility. A VDI score ≥5 was used a priori to indicate severe damage, reflecting associations with mortality.10 VDI data were collected prospectively at 0, 3, 6, 12 and 18 months and at LTFU. Individual VDI items were used to describe early (6 months) and late (LTFU) damage. The 10 most frequently scored individual VDI items were determined at each time point based on all available VDI data. Fifteen damage items were defined a priori as being potentially related to treatment, based on a previous list of treatment-related VDI items11 (osteoporosis, diabetes, cataracts, atrophy and weakness, malignancy, gonadal failure, marrow failure, chemical cystitis, avascular necrosis), and items related to treatment or active disease: hypertension, angina/coronary artery disease, alopecia, cerebrovascular accident, myocardial infarction and mouth ulcers. Immunosuppressive treatment regimens are summarised in table 1. All patients underwent remission induction with cyclophosphamide, then switched to azathioprine maintenance, except those randomised to methotrexate induction in NORAM,22 and Rituximab induction with no maintenance in RITUXVAS.24 High-dose glucocorticoids and plasma exchange were allowable. Local investigators made treatment decisions post-trials. No data was available on cardiovascular risk factor management. The LTFU questionnaire recorded whether patients were on glucocorticoids at their last visit, and if they had received glucocorticoids within the following post-trial months: 13–18 (MEPEX only), 19–24, 25–36, 37–48 and 49–60. Total duration of glucocorticoid use was defined as months of glucocorticoid use within the original trial plus follow-up. Data from the six trials were combined and analysed within SPSS V.20 and Stata V.9. Continuous variables are expressed as mean with SD or median with IQR; categorical variables as frequencies with percentages, all with 95% CIs. Datasets for analysis were defined in terms of the VDI data provided; no imputation of missing data was performed. To maximise available VDI data and limit possibility of bias, three datasets were created: (1) patients with VDI data at 6 months, (2) patients with VDI data at LTFU, and (3) for comparison of VDI data across time, patients with data at baseline, 6 months, 12 months, and LTFU. The existence and extent of any non-response bias was estimated from comparisons of baseline data between responders and non-responders. The statistical significance of differences between groups in terms of continuous data was determined from independent sample t tests or Mann–Whitney tests, and in terms of proportions using χ2 tests. Repeated measures analysis of variance was used to compare groups in terms of change in VDI scores over time. Statistical significance was taken at the 5% (p<0.05) level throughout. Seven hundred and thirty-five patients with a mean age of 57.6 (SD 14.4) years, 415 (56.7%) male, participated in the six trials (table 2). Over half (54.8%) had GPA. On ANCA subtyping, 411 (56.8%) were PR3-ANCA and 277 (38.3%) MPO-ANCA. The median baseline creatinine was 192 µmol/L (IQR 98.7 to 440) and median total BVAS score 16 (IQR 10–23). Four hundred and sixty-seven patients (87.3% of the 535) had data at LTFU, with a mean of 87 months (7.3 years; SD 26.4 months) follow-up. Of these 467, 302 (64.7%; 56.4% of the 535) had VDI data at LTFU and had been followed for a mean of 85 months (7.1 years; SD 25.1 months). Baseline demographics of those with and without VDI data at LTFU are shown in table 2. Patients with no VDI data had higher serum creatinine and erythrocyte sedimentation rate (ESR) at baseline than patients with VDI data (both p<0.01). 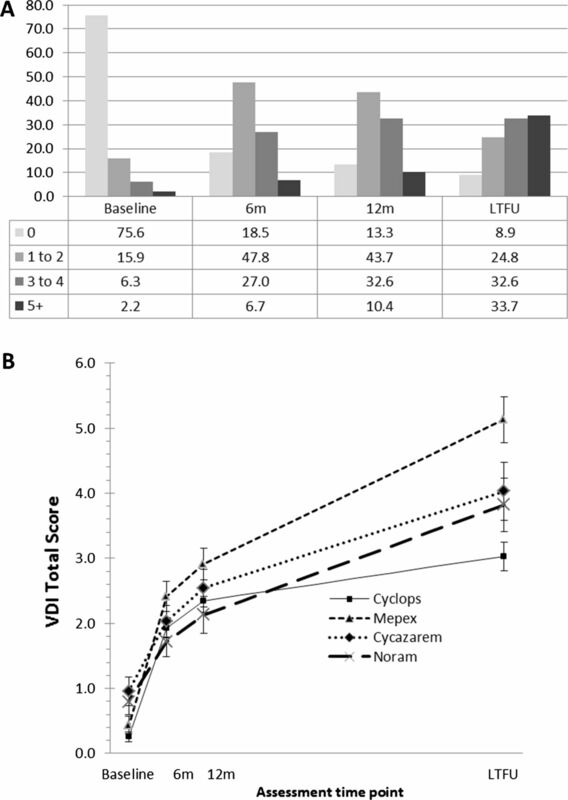 There was a higher frequency of patients with VDI data at LTFU from the CYCLOPS trial (p<0.01). By LTFU, 133 patients had died, 46 (15.2%) of those with VDI data at LTFU (ie, after their last clinic attendance) (n=302), and 87 (37.3%) of those without (n=233). Fifty-one per cent of MEPEX patients had died (70/137), 17.4% (27/155) from CYCAZAREM, 16.9% (25/148) from CYCLOPS and 11.6% (11/95) from NORAM (overall χ2=69.1, df=3, p<0.001). Cause of death was available for 84 patients, and attributed to vasculitis in 16 (19.0%), immunosuppression in 24 (28.6%) and sepsis in 31 (36.5%), with no differences between trials. Almost 300 patients (n=296; 63.4% of the 467, 55.3% of the 535) had data on glucocorticoid use. Within these, 139/291 (47.8%) were on glucocorticoids at their last visit, with the mean length of glucocorticoid use being 40.4 months (SD 16.7; median 36.0, IQ range 2 to 60). Eighty-three patients (28.0%) used glucocorticoids for 60 months, 64 (21.6%) 37–54 months, 103 (34.8%) 19–36 months, and 46 (15.5%) 1–18 months. Assessment of early damage was based on 531 patients (72.2% of the 735) with VDI data at 6 months (n=215 MPA, n=316 GPA); assessment of late damage on 302 patients (56.4% of the 535) with VDI data at LTFU (n=135 MPA, n=167 GPA). The most frequently recorded items of damage at 6 months and LTFU overlapped (figures 1A,B). Three of the six most frequent items of damage were renal: proteinuria, GFR<50 mL/min and hypertension. Proteinuria and GFR<50 mL/min were more common in MPA; nasal crusting, hearing loss and peripheral neuropathy more common in GPA. In terms of ANCA subtype, at 6 months and LTFU patients with PR3 versus MPO antibodies were significantly more likely to have hearing loss, nasal crusting and less likely to have GFR<50 mL/min (figure 1C,D). Of the 32 patients with ≥5 VDI items at baseline, 25 (78.1%) were positive for PR3 antibody and only five (15.6%) for MPO; by 6 months this difference had disappeared. Frequency of the 10 most common Vasculitis Damage Index (VDI) items by clinical subtype. (A) At 6 months (n=531; 215 MPA, 316 granulomatosis with polyangiitis (GPA)); (B) At long-term follow-up (LTFU) (n=302; 135 microscopic polyangiitis (MPA), 167 GPA). Frequency of the three items significantly associated with antineutrophil cytoplasm antibody (ANCA) serology; (C) At 6 months (n=529; 181 myeloperoxidase (MPO), 319 PR3, 14 MPO and PR3, 15 negative); (D) At LTFU (n=301; 110 MPO, 172 PR3, 6 MPO and PR3, 13 negative). *p<0.05; **p<0.01; ***p<0.001;****p<0.0001. Among the 302 patients with VDI data at LTFU, the majority (n=48, 87%) of the 55 patients from NORAM (entry criteria: creatinine<150µmol/L) had no renal-related VDI items at LTFU; this differed from the 61 MEPEX patients (entry criteria: creatinine >500 µmol/L or required dialysis), 95% (n=58) of whom had acquired at least one renal-related item (χ2 p<0.0001). Mean (SD) total VDI scores in the 270 patients with data at baseline, 6, 12 months and LTFU increased from 0.57 (1.31) at baseline, to 2.00 (1.71) at 6 months, 2.45 (2.02) at 12 months, and 2.66 (1.75) at LTFU, the number of patients with ≥1 VDI item increasing from 66 (24.4%) at baseline, to 220 (81.5%) at 6 months, 234 (86.7%) at 12 months, and 246 (91.1%) at LTFU (figure 2A). The numbers of patients with ≥5 VDI items were 6 (2.2%) at baseline, 18 (6.7%) at 6 months, 28 (10.4%) at 12 months, and 91 (33.7%) at LTFU (figure 2A). (A) Percentage of patients in Vasculitis Damage Index (VDI) score groups at baseline, 6 months, 12 months and long-term follow-up (patients with data at all four assessments, n=270); (B) Total VDI scores over time by trial for n=270 patients with valid data at all assessments (Cyclops n=101; Mepex n=46; Cycazarem n=70; Noram n=53). There was no difference over time between patients with MPA and GPA in terms of total VDI score (mean 2.15 vs 2.26, respectively, repeated measures ANOVA p=0.58), although scores at baseline were lower in MPA patients (mean 0.38 vs 0.73, M-W test p=0.014) with 83% having no damage compared with 70% of GPA patients (χ2p=0.014) (figure 1A). Total VDI scores differed over time between patients in the four trials (p=0.036), with differences at each time point (p<0.001) and a significant interaction between time and trial (p<0.001) (figure 2B). Correlations between total BVAS scores at baseline and VDI scores at 6 months (r=0.139, p=0.001) and LTFU (r=0.139, p=0.016), were low; between simultaneous BVAS and VDI scores there was either no (6 months r=0.025, p=0.606) or low correlation (12 months r=0.131, p=0.008). At LTFU, potentially treatment-related VDI items were reported for two-thirds of patients (n=201, 66.6%, of the 302 patients with data at LTFU; n=177, 65.6%, of the 270 with complete follow-up data) with 92/302 (30.5%; 81/270, 30.0%) having one item of damage, and 52/302 (17.2%; 45/270, 16.7%) ≥3. The frequency of these items among the 270 patients over the course of follow-up is shown in table 3. At LTFU, the most commonly reported items were hypertension, osteoporosis, malignancy and diabetes (table 3). We would like to thank those who returned the questionnaires; and the investigators of the included trials.
. Revised international Chapel hill consensus conference nomenclature of Vasculitides. Arthritis Rheum 2012.
. Long-term patient survival in ANCA-associated vasculitis. Ann Rheum Dis 2011;70:488–94.
. Wegener granulomatosis: an analysis of 158 patients. Ann Intern Med 1992;116:488–98.
. Early mortality in systemic vasculitis: relative contribution of adverse events and active vasculitis. Ann Rheum Dis 2010;69:1036–43.
. Risk factors for relapse of antineutrophil cytoplasmic antibody-associated vasculitis. Arthritis Rheum 2012;64:542–8.
. 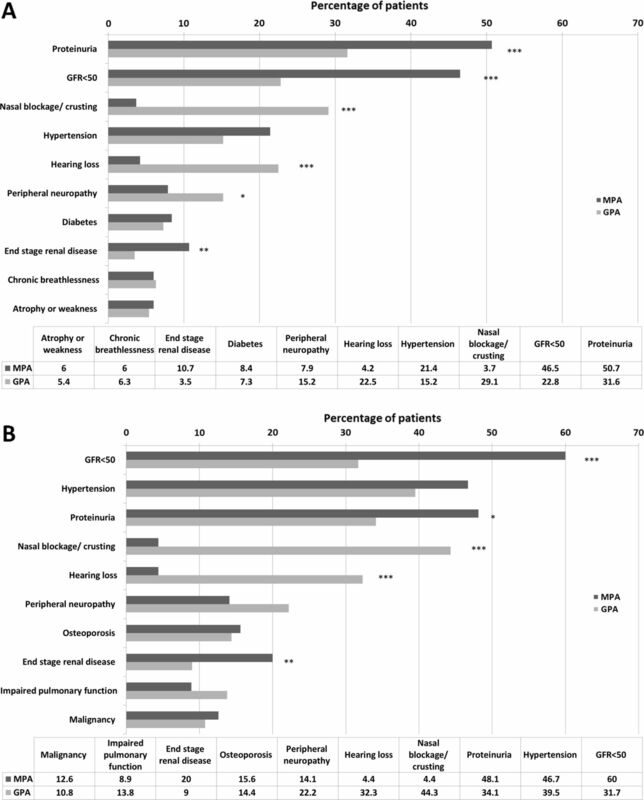 Increased morbidity from ischemic heart disease in patients with Wegener's granulomatosis. Arthritis Rheum 2009;60:1187–92.
. A model to predict cardiovascular events in patients with newly diagnosed Wegener's granulomatosis and microscopic polyangiitis. Arthritis Care Res (Hoboken) 2011;63:588–96.
. The OMERACT core set of outcome measures for use in clinical trials of ANCA-associated vasculitis. J Rheumatol 2011;38:1480–6.
. Development and initial validation of the Vasculitis Damage Index for the standardized clinical assessment of damage in the systemic vasculitides. Arthritis Rheum 1997;40:371–80.
. Damage occurs early in systemic vasculitis and is an index of outcome. QJM 1997;90:391–9.
. Examination of disease severity in systemic vasculitis from the novel perspective of damage using the vasculitis damage index (VDI). Br J Rheumatol 1998;37:57–63.
. Predictors of damage and survival in patients with Wegener's granulomatosis: analysis of 50 patients. J Rheumatol 2010;37:374–8.
. Predictors of survival and organ damage in Wegener's granulomatosis. Rheumatology (Oxford) 2002;41:572–81.
. Damage caused by Wegener's granulomatosis and its treatment: prospective data from the Wegener's Granulomatosis Etanercept Trial (WGET). Arthritis Rheum 2005;52:2168–78.
. Outcome analysis of patients with vasculitis associated with antineutrophil cytoplasmic antibodies. Clin Nephrol 1999;52:344–51.
. EULAR recommendations for conducting clinical studies and/or clinical trials in systemic vasculitis: focus on anti-neutrophil cytoplasm antibody-associated vasculitis. Ann Rheum Dis 2007;66:605–17. European therapeutic trials in ANCA-associated systemic vasculitis: disease scoring, consensus regimens and proposed clinical trials. European Community Study Group on Clinical Trials in Systemic Vasculitis ECSYSVASTRIAL. Clin Exp Immunol 1995;101(Suppl 1):29–34. Etanercept plus standard therapy for Wegener's granulomatosis. N Engl J Med 2005;352:351–61.
. A randomized trial of maintenance therapy for vasculitis associated with antineutrophil cytoplasmic autoantibodies. N Engl J Med 2003;349:36–44.
. Randomized trial of plasma exchange or high-dosage methylprednisolone as adjunctive therapy for severe renal vasculitis. J Am Soc Nephrol 2007;18:2180–8.
. Pulse versus daily oral cyclophosphamide for induction of remission in antineutrophil cytoplasmic antibody-associated vasculitis: a randomized trial. Ann Intern Med 2009;150:670–80.
. Randomized trial of cyclophosphamide versus methotrexate for induction of remission in early systemic antineutrophil cytoplasmic antibody-associated vasculitis. Arthritis Rheum 2005;52:2461–9.
. Mycophenolate mofetil vs azathioprine for remission maintenance in antineutrophil cytoplasmic antibody-associated vasculitis: a randomized controlled trial. JAMA 2010;304:2381–8.
. Nomenclature of systemic vasculitides. Proposal of an international consensus conference. Arthritis Rheum 1994;37:187–92.
. Development of comprehensive disease assessment in systemic vasculitis. Ann Rheum Dis 2007;66:283–92.
. Measurement of damage in systemic vasculitis: a comparison of the Vasculitis Damage Index with the Combined Damage Assessment Index. Ann Rheum Dis 2011;70:80–5.
. Incidence of malignancy in patients treated for antineutrophil cytoplasm antibody-associated vasculitis: follow-up data from European Vasculitis Study Group clinical trials. Ann Rheum Dis 2011; 70:1415–21.
. Damage assessment in ANCA-associated vasculitis. Curr Rheumatol Rep 2012;14:494–500. Contributors Conception and design: JR, RL, KW, DJ, HD; analysis and interpretation of the data: JR, HD, RL; drafting of the article: JR, HD, RL; intellectual property: JR, AM, RL, HD, RS, OF, LH, PH, DJ, KW; final approval of the article: JR, HD, RL; statistical expertise: HD, JR; obtaining of funding: RL, KW, DJ; administrative, technical or logistical support: JR, OF, RL, HD; collection and assembly of data: OF, JR, HD, RL. Funding JR was supported by an NIHR Clinical Lectureship; JR and RL were supported by the Oxford Musculoskeletal Biomedical Research Unit. The funding sources had no involvement in the study's design, conduct or reporting. Competing Interests JR has received payment for lectures from Nordic Pharma, a consultancy for vasculitis disease assessment training from GlaxoSmithKline and a travel bursary from Chugai Pharma. AM has received a travel bursary from Laboratoire Francais de Biotechnologie (LFB). RL has received a consultancy for vasculitis disease assessment training with Nordic Pharma, Chemocentryx, Human Genome Science and GlaxoSmithKline and money to his institution from Nordic Pharma for an administrator to assist in disease assessment training in vasculitis. HD, RS, OF, LH, PH, DJ, and KW have no potential conflicts of interest. Ethics approval This study was conducted with the approval of the West Midlands Multicentre Research Ethics Committee (ref: MREC/98/7/37).